15th November 2010 - Started the task of adding my Paradiso Club Posters collection to the site. 30th September 2010 - Stranglers Concert Tickets added, Siouxsie concert tickets added. 20th September 2010 - Rolling Stones 1969 Handbill, Rolling Stones 1978 tickets added. 15th September 2010 - Paul Weller handbills added. Beatles 1963 tickets and Paul Weller tickets added. Derek and the Dominos ticket and Yardbirds ticket added. Siouxsie handbills added. Beatles 1964 ticket in Australia and Let it Be first screening invitation added. 8th September 2010 - Various Rolling Stones tickets added. 1st September 2010 - Paul Weller concert posters added and additional Siouxsie Handbills added. 20th August 2010 - Siouxsie & the Banshees handbills added. 9th August 2010 - Beween December 2007 and now I did not stopped adding to my websites, just the update page. I have now restarted the updates pages due to numerous requests to do so, but on an abbreviated basis. I have decided to stop adding to the update page, as it takes up far too much time. This will give me more time to continue to add to the online collection. 15th December 2007 - Rolling Stones tickets for the following dates 13th February 1964 (Granada Theatre, Kingston), 24th July 1978 (Anaheim Stadium), 6th July 1975 (Cotton Bowl, Dallas), 30th November 1981 (Pontiac Silverdome), 28th September 1973 (Olympiahalle, Munich), 20th July 1990 (Maine Road, Manchester), 16th January 1998 (Madison Square Garden, New York), 16th October 1997 (Giants Stadium, New York). 14th December 2007 - The Jam programmes for the following dates 7th-8th April 1980 (Rinbow Theatre, London), 13th-16thMay 1981 (Japan Tour), 3rd-10th July 1980 (Japan Tour), 11th-17th June 1982 (Japan Tour). Style Coucil programmes for 2nd-13th August 1985 (Rock in Japan 1985), 2nd April 1987-6th April 1987 (Japan Tour), 6th-9th June 1989 (Japan Tour).Paul Weller programme for 1995 (Match Day Volume 4), Eric Clapton Handbills for 21st August 1970 (Marquay Club, Torquay), 6th June 2001 (The Palace of Auburn Hills, Michigan), 4th - 6th December 1990 ( Budokan, Tokyo). Eric Clapton tickets for 31st January 1991 ( The Point Theatre, Dublin), 30th June 2004 (Madison Square Garden, New York). Ticket for the Paul Weller on 18th November 2005 (Brentwood Centre). 12th Deember 2007 - Rolling Stones programmes for the following dates North American Tour 1972., Voodoo Lounge Tour - Japan Leg 1995, North American Tour 1989. Rolling Stones tickets for the following dates 23rd June 2007 (Anoeta Donostia, San Sebastian), 16th August 2006 (Campo de Futbol Santo Domingo el Ejido, Almeria), 3rd July 1982 ( Paderstadion, Vienna), 4th June 1999 ( Murrayfield Stadium, Edinburgh), 7th October 1981 ( San Diego Stadium), 18th July 1990 ( St. James Park, Newcastle), 16th August 1990 (Gelsenkirchen Parkstadion), 20th August 2006 ( Twickenham Stadium, London). 11th December 2007 - Jam Handbill for 12th April 1979 ( Orpheum Theater, Boston). Jam programmes for Beat Surrender Tour '82, Trans Global Express Tour 1982, 21st June 1980 (Loch Lomond Festival). Style Council programme for Internationalists '85 Tour, Paul Weller programmes for 25th October 2006 (BBC Electric Prom 06), 13th July 1997 ( T in the Park, Balado). Paul Weller Handbills for the following dates 18th November 1990 (Paul Weller Movement Live), 10th April 1991 ( Paul Weller Movement Live Part II), 12th July 2001 ( Solo Acoustic Tour 2001), 16th October 1997 ( Japan Tour 1997), 29th March 2006 (Nakano Sun Plaza, Tokyo), 31st March 2006 (Zepp Club, Tokyo). Handbills for Siouxsie & the Banshees on 30th August 1979 (Friars, Aylesbury), 23rd April 1977 (The Roxy Club, London), 24th November 1991 (James L Knight Center, Miami), 16th March 1978 (Alexandra Palace, London), 27th October 2007 (Ancienne Belgique, Brussels). 2nd December 2007 - Cream handbills for the following dates 19th May 1968 (Community Concourse, San Diego), 11th March 1968 (Memorial Auditorium, Sacramento), 13th March 1968 (Selland Arena, Fresno), 28th November 1967 ( Marquee Club, London), 8th November 1966 ( Marquee Club, London), 5th May 1968 ( Magoo's & New City Opera House, Minneapolis). 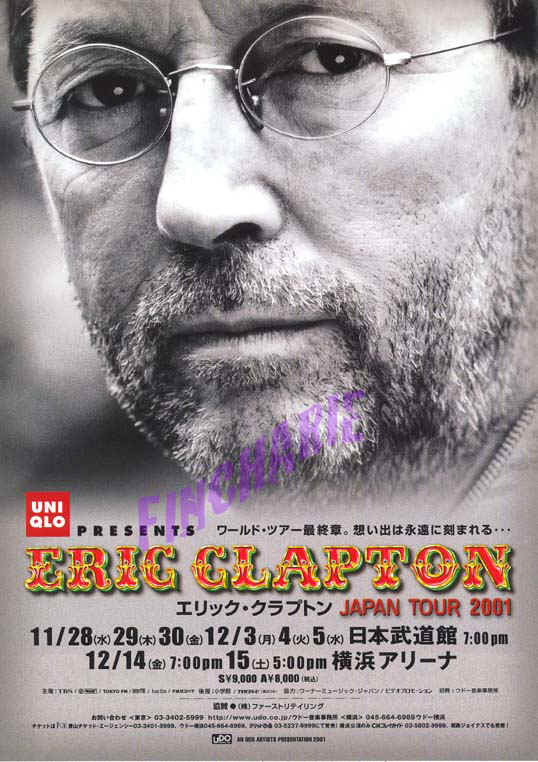 Eric Clapton Handbills for 25th May 1998 (America West Arena, Phoenix), 28th November 2001 ( Budokan, Tokyo). Programmes for Cream performances on 3rd April 1968 ( Morris Civic Auditorium, Indiana), 7th April 1968 ( Eastman Theatre, New York), 7th May 1967 ( Empire Pool, Wembley), 29th October 1967 ( Saville Theatre, London), 17th May 1968 ( Anaheim Convention Center). 4th November 2007 - Eric clapton tickets added for the following dates 26th October 2005 (Madison Square Garden, New York), 30th May 1979 (Community War Memorial Coliseum, Rochester), 4th June 1979 (Sports Arena, Toledo), 9th May 2006 (MEN Arena, Manchester), 6th March 2001 (Schleyhalle, Stuttgart), 14th January 1990 (NEC Arena, Birmingham), 3rd September 1995 (Thompson Boling Arena, Knoxville), 11th September 1988 (Nassau Coliseum, New York), 8th October 1994 (Madison Square Garden, New York), 22nd August 1992 (Shea Stadium ,New York), 6th August 1990 (Meadowlands Arena, East Rutherford), 6th April 1990 (Nassau Coliseum, New York), 25th May 1983 (Guildford Civic Hall), 3rd February 2001 (Royal Albert Hall, London). 3rd November 2007 - Eric Clapton tickets added for the following dates 17th August 1990 (Nassau Coliseum, Uniondale), 9th May 1996 (Roseland Ballroom, New York), 18th September 1995 (Madison Square Garden, New York), 26th April 2004 (SECC, Glasgow), 15th February 1995 (SECC, Glasgow). Guest passes for Eric Clapton performances on 28th November 1984 (Entertainment Centre, Perth), 28th November 1994 (Irving Plaza, New York), 23rd November 1994 (House of Blues, New Orleans), 25th October 1997 (Rainbow Hall, Nagoya), 17th May 1980 (Hammersmith Odeon, London), 11th May 2006 (NEC Birmingham). 28th October 2007 - The Jam, Style Council and Paul Weller tickets for the following dates 22nd February 1987 (NEC Arena, Birmingham), 27th April 1982 (Ancienne Hall, Brussels), 3rd December 1982 (Wembley Arena, London), 10th December 1980 (Winter Gardens, Malvern), 14th March 1982 (The Brighton Centre), 20th November 1995 (The Labatts Apollo, Manchester), 27th June 1981 (Bingley Hall, Birmingham), 17th June 1977 (Seaburn Hall, Sunderland), 15th December 1981 (Hammersmith Palais, London), 1st October 1982 (Bingley Hall, Birmingham), 11th November 1980 (Bingley Hall, Birmingham), 8th December 1982 (Bingley Hall, Birmingham), 25th November 1979 (Bingley Hall, Birmingham), 2nd December 2006 (The Brighton Centre), 2nd October 2002 (Carling Apollo, Manchester), 19th October 2002 (NEC Arena, Birmingham), 16th November 2005 (The Refectory, Leeds University), 1st December 1990 (Bradford University), 28th September 1982 (Whitley Bay Ice Rink), 30th November 2005 (Colston Hall, Bristol), 27th November 1990 (UEA, Norwich), 27th September 1982 (Royal Highland Exhibition Hall, Ingliston), 8th April 1982 (Apollo Theatre, Glasgow), 6th December 2006 (The Forum, London), 6th December 2006 (The Forum, London), 5th December 1982 (Wembley Arena, London), 20th March 1982 (Bingley Hall, Birmingham), 17th June 1981 (Rainbow Theatre, London). Eric Clapton Guest passes for 9th October 1997 (Olympic Gymnasium, Seoul), 24th February 1996 (Royal Albert Hall, London), 23rd September 1995 ( The Palace, Auburn Hills), 14th September 1995 (Spectrum, Philadelphia), 9th September 1995 (Dean E. Smith Center, Chapel Hill), 3rd September 1995 (Thompson Boling Arena, Knoxville), 24th April 1995 (Festhalle, Frankfurt), 10th April 1995 (The Forum, Copenhagen), 8th April 1995 (The Globe, Stockholm), 7th April 1995 (Spektrum, Oslo), 5th March 1993 (Royal Albert Hall, London), 6th March 1993 (Royal Albert Hall, London). 25th September 2007 - Added the following Pink Floyd tickets 15th April 1988 (Memorial Coliseum, Los Angeles), 8th December 1987 (Kingdome, Seattle), 7th May 1977 (Anaheim Stadium, Los Angeles). Paul Weller/Jam/Style Council tickets for the following dates 11th December 1982 (The Brighton Centre), 3rd April 1982 (City Hall, Newcastle), 29th September 1982 (Whitley Bay Ice Rink), 1st October 1982 (Bingley Hall, County Showground), 11th December 1979 (Queens Hall, Leeds), 31st October 1980 (Apollo Theatre, Manchester), 22nd July 1997 (Cornwall Coliseum, St. Austell), 9th June 1985 (Odeon Theatre, Birmingham), 19th July 1987 (Academy Theatre, London), 8th December 1985 (Wembley Arena, London), 9th December 1985 (Wembley Arena, London), 23rd November 1995 (The Sanctuary, Milton Keynes), 3rd December 2006 (Lighthouse, Poole), 19th June 2007 (Plymouth Pavilions). 24th September 2007 - Another long and enjoyable summer. More Rolling Stones tickets added for the following dates 29th October 1989 (Shea Stadium, New York), 22nd November 2006 (Aloha Stadium, Hawaii), 28th November 1997 (Kingdome, Seattle), 4 November 1989 (Oakland Stadium), 14th November 1997 (Oakland Stadium), 25th July 1972 (Madison Square Garden, New York), 14th October 1981 (Kingdome, Seattle), 3rd August 1994 (RFK Stadium, Washington), 20th June 1999 (Mungersdorfer Stadion, Cologne). Paul Weller tickets added for the following dates 27th September 1982 (Royal Highland Exhibiyion Hall, Ingliston), 7th July 1998 (Colston Hall, Bristol), 7th December 2001 (Colston Hall, Bristol), 9th June 1996 (Finsbury Park, London), 12th June 2003 (The City Hall, Newcastle). More Eric Clapton tickets for the following dates 27th June 1992 (Wembley Stadium, London), 12th February 2001 (Sheffield Arena), 10th October 1994 (Madison Square Garden, New York), 16th April 1987 (McNichols Arena, Denver), 8th June 1979 (Market Square Arena, Indianapolis), 3rd May 1980 (The Brighton Centre), 17th June 1977 (Rhein - Neckar Halle, Eppelheim), 11th November 1978 (Festhalle, Frankfurt). Siouxsie & the Banshees tickets added for the following dates 7th August 1981 (Apoolo Theatre, Manchester), 13th September 1988 (Apollo Theatre, Manchester), 22nd January 1995 (Rock City, Nottingham), 16th November 1982 (Playhouse Theatre, Edinburgh), 4th November 1985 (Royal Court Theatre, Liverpool), 2nd February 1992 (Universal Amphitheatre, Los Angeles), 31st August 1981 (Gaumont Theatre, Southampton), 24th November 1982 (Gaumont Theatre, Southampton), 25th November 1982 (Gaumont Theatre, Southampton), 22nd June 1984 (The Brighton Centre), 12th December 1988 (Royal Court Theatre, Liverpool), 25th July 1981 (Gaumont Theatre, Ipwsich), 7th October 1985 (City Hall, Sheffield). 30th January 2007 - Beatles ticket for 17th September 1964 (Municipal Stadium, Kansas City). Also contine with more Rolling Stones tickets including 13th July 1990 (Wembley Stadium, London), 24th November 2006 (Idaho Center Arena, Nampa), 22nd November 1997 (MGM Grand Garden Arena, Las Vegas), 7th July 1990 (Wembley Stadium, London), 11th November 1989 (Cotton Bowl, Dallas, Texas), 21st October 1989 (Los Angeles Coliseum). Started the Siouxsie and the Banshees pages for all you punk fans ! Dates include 24th June 1984 (Hammersmith Palais Ballroom), 31st August 1981 (Gaumont Theatre, Southampton), 28th November 1980 (Whisky a Go Go, Los Angeles), 17th June 1984 (Edinburgh Playhouse), 19th November 1982 (Futurist Theatre, Scarborough), 31st October 1985 (The Capitol, Aberdeen). 21st January 2007 - Added to the Eric Clapton ticket section with the following dates 14th April 1987 (Forum, Los Angeles), 2nd July 1983 ( Jones Beach Amphitheater, New York), 28th June 1992 (Wembley Stadium, London), 14th April 1998 (Fleet Center, Boston), 3rd May 1985 (Forum de Montreal, Quebec), 17th February 1983 (Mid South Coliseum, Memphis), 23rd January 1988 (NEC Arena, Birmingham), 20th July 1974 (Long Beach Arena, Los Angeles), 9th April 1979 (The Summit, Houston, Texas), 3rd February 1988 (Royal Albert Hall, London), 28th July 2006 (Spektrum, Oslo), 3rd March 1992 (SECC, Glasgow). 20th January 2007 - Finally got around to start the Pink Floyd ticket section with tickets for the following dates 20th June 1975 (Three Rivers Stadiun, Pittsburg), 7th October 1987 (Madison Square Garden, New York), 3rd and 4th June 1988 (Giants Stadium, East Rutherford, New Jersey), 31st May 1994 (Three Rivers Stadium, Pittsburg), 12th October 1987 (Meadowlands Arena, East Rutherford, New Jersey), 10th November 1987 (Pontiac Silverdome, Michigan), 15th July 1994 (Pontiac Silverdome, Michigan), 5th August 1988 (Wembley Stadium, London). Continued adding more Paul Weller tickets to the ever expanding Jam/Paul Weller section, dates include 20th November 2004 (Carling Apollo, Manchester), 8th December 1985 (Wembley Arena, London), 24th November 2005 (MEN Arena, Manchester), 16th November 1992 (Roxy Theatre, Los Angeles), 31st July 1997 (Wessex Hall, Poole Arts Centre), 6th & 7th December 1991 (Variety Arts Theatre, Los Angeles). ( Convention Center, Dallas, Texas), 26th February 1996 (Royal Albert Hall, London), Set of nine stubs for 27th April 1968 ( Coliseum, Chicago), 27th September 1988 ( Tacoma Dome, Washington), 2nd August 1974 ( Greenboro Coliseum, North Carolina), 25th October 1968 ( Dallas Memorial Auditorium, Texas), 29th August 1975 (Greenboro Coliseum, North Carolina). 8th January 2007 - Continuing with the Paul Weller section with tickets for the following dates 12 July 1997 (T in the Park, Baldo, Scotland), 13th July 1997 (T in the Park, Baldo, Scotland), 2nd August 1997 (National Sports Centre, Crystal Palace, London), 7th November 2004 (Clyde Auditorium, SECC, Glasgow), 13th August 1996 (Victoria Hall, Hanley), 2nd December 1994 (GMEX Centre, Manchester), 17th April 2000 (Trentham Gardens, Stoke on Trent), 4th December 1991 (Variety Arts Hall, Los Angeles). 7th January 2007 - Continuing the theme of last year by filling in the gaps of Beatles tickets for dates which I do not already have. Dates added include 6th November 1964 (Gaumont Theatre, Southampton), 13th October 1964 (ABC Cinema, Wigan), 19th October 1964 (ABC Cinema, Edinburgh), 9th October 1994 (Gaumont, Bradford), 4th January 1964 (Astoria, Finsbury Park), 11th January 1964 (Astoria, Finsbury Park), 29th April 1964 (ABC Cinema, Edinburgh), 28th December 1964 (Odeon, Hammersmith), 28th October 1964 (ABC Cinema, Exeter), 10 December 1963 ( Gaumont, Doncaster), and a Handbill for 30th July 1962 (Blue Penguin Club, Bootle).